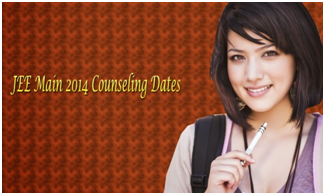 The JEE Main 2014 counselling, which was expected to begin from July 1, 2014, however, will start only after the All India Ranks are declared by CBSE(Central Board of Secondary Education) on July 7. The final schedule & flow chart will be uploaded only thereafter. Here, take a look at the important dates for JEE Main 2017 counselling ! The main reason for the delay in the JEE Main 2014 counselling is due to the failure of state boards who could not submit their data on time. It is vital for the candidate to check and confirm their marks that JEE Mains has received by the respective examination board. In case of any discrepancy, candidates will be required to upload their official mark sheet. The last date for the same is July 3. For any clarification, the candidates can write to jeeboardmarks@gmail.com giving 'Confirmation of Class 12th Board Marks' in subject line.